Disclosure: I was not compensated for this post. I received a copy of the Blu-ray to facilitate this post. Opinions expressed are my own. 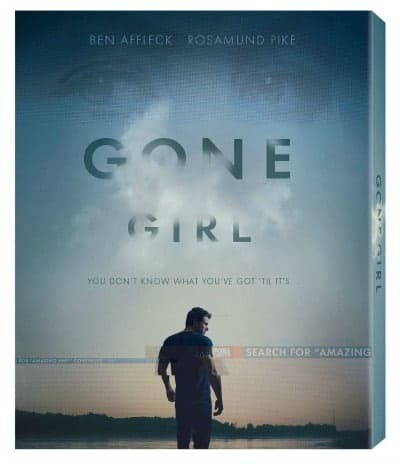 Gone Girl – directed by David Fincher and based upon the global best seller by Gillian Flynn – unearths the secrets at the heart of a modern marriage. On the occasion of his fifth wedding anniversary, Nick Dunne (Ben Affleck) reports that his beautiful wife, Amy (Rosamund Pike), has gone missing. Under pressure from the police and a growing media frenzy, Nick’s portrait of a blissful union begins to crumble. Soon his lies, deceits and strange behaviour have everyone asking the same dark question: Did Nick Dunne kill his wife? Every Blu-ray comes with an exclusive new Amazing Amy story – “Tattle Tale”. The 36-page children’s book is only available with the purchase of the Gone Girl Blu-ray. At the beginning of 2013, I read a book by a new-to-me author, Gillian Flynn. That book was Gone Girl and it ended up being one of the best books I’ve ever had the pleasure of reading. Last year, I put it on my list of Recommended Books to Read in 2014 and also immediately went out and purchased her two other books, Dark Places and Sharp Objects. I couldn’t get enough Gillian Flynn! Then I heard about the Gone Girl movie coming out and was anxiously anticipating its release. I was curious to see how it compared to the book. I won’t go too deep into the storyline because there is a major spoiler that will ruin it for you if you’ve never read the book. Let’s just say that while reading the book there was a huge OMG moment. I didn’t expect this twist and it was so shocking that I exclaimed a few choice words in the middle of the night. It was brilliant! I was curious to see how that twist would be handled in the movie and it was pretty on par with the book. It didn’t have the same shock effect for me because I knew it was coming. Both Ben Affleck and Rosamund Pike were perfect in their roles as Amy and Nick Dunne and captured the essence of both characters. I wasn’t sure at first about Ben Affleck being cast as Nick Dunne, but he did an amazing job. I couldn’t imagine any other actor playing that part now that I’ve seen the movie. The movie is over 2 hours long (149 minutes), but it didn’t seem that way. The story is so engaging and dark that the minutes flew by. John hasn’t seen it yet and I plan to watch it again with him. I’ll be watching his reaction to key twists in the plot. I wonder if he will be blindsided like I was about the book. You might also like books like Gone Girl. I have not read the book yet and am looking forward to seeing the movie soon! Thanks for the review! Loved the movie and i’m excited to getting the to read the book. I have not read the book yet so I would like to do that before I see the movie. I have heard good things about both the book and the movie. I haven’t watched this movie yet but I have read the book so I might get this DVD! I can’t wait to see Ben Affleck’s and Rosamund Pike’s performance. This is a great movie — loved it! I read the book first and enjoyed the film as well. Great review. I can’t wait to see the movie and read the book. I am looking forward to seeing the movie soon! WIll be watching this DVD very soon. Like that NPH is in this, too! I haven’t read the book nor have I seen the movie. sounds like a movie that has to be seen and a book that has to be read 🙂 I like Ben Affleck too and a mystery is always good. Cannot wait to see the movie but waiting to read the book this summer. I am looking forward to watching this. I have heard really good reviews all-around. Haven’t seen the movie or read the book, but, your review has piqued my interest. Will have to get it! I’ve been seeing this everywhere and I’m definitely interested in both the book and movie! I read the book and loved it, but when I read reviews of the movie, I found that there are scenes that I’d rather not “see”, so I don’t know if I’ll ever watch the movie. I haven’t seen this, but it sounds like maybe I should! Loved the movie when I saw it in the theatre… Thank you for the review and the reminder; I wanted to pick up a copy. Loved the book, still have to try out the movie. Would have loved to see this in the movies ; I can’t wait to get it so I could watch it. Such an amazing twisted movie!! Definitely want to read the book! I didn’t read the book, and just finished watching it with my hubby tonight, Am I the only one that didn’t care for the ending? For the most part, the movie was good-great twist, but I felt cheated at the end. I would have much preferred a different ending! When I was reading the book, I thought OMG I can’t believe this is happening. It wasn’t expected at all. I am so looking forward to seeing the movie and reading the book as well they both sounds amazing. I thought Rosamund Pike was great in Gone Girl, it’s definitely worth purchasing the Blu-Ray or DVD. Thank you for sharing this post. I haven’t read the book yet!